recorded at The Manor, January 1972. 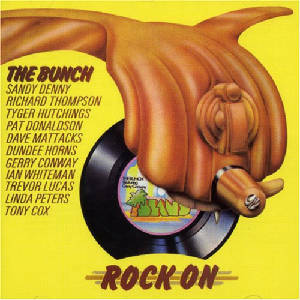 The Bunch was an ad hoc collection of 'Fairport/Fotheringay/Eclection family' members who gathered together to record this collection of rock'n'roll songs. The reason behind the recording was to test the newly-opened Manor studios. Sandy was listed as being "Britain's first lady of song, if you don't count Dorothy Squires. "Ashley 'Tyger' Hutchings wished to be known as Ron Smith, for this recording, but the real Ron Smith objected. Organized by Trevor Lucas and Sandy Denny following the breakup of Fotheringay, The Bunch features an all-star cast from the British folk-rock scene paying homage to their roots before they began their musical trek down the traditional path of Francis James Childs and Cecil Sharp. Recorded in January of 1972, The Bunch was just that, a one-off by a bunch of friends getting together to play the music of some of their early idols, including Buddy Holly, Elvis Presley, Hank Williams and Chuck Berry. Lucas, Denny, Richard Thompson, Linda (Thompson) Peters, Ashley Hutchings and various other members of the extended Fairport Convention family, treat the music with a certain reverence while at the same time injecting it with a playfulness and ragged British charm. Sandy Denny, who is touted in the liner notes as "Britain's first lady of song," delivers two of her finest performances on record, a lovely duet with Peters on the Everly Brothers' "When Will I Be Loved" (which predated Linda Ronstadt's cover by two years), as well as her tender reading of the Buddy Holly obscurity "Learning the Game." Other highlights include Richard Thompson's spirited working of Dion's "My Girl the Month of May," Ashley Hutchings' deadpan "Nadine" and Linda Peters' "Loco-motion." The original U.K. release included a flexi-single of ex-Fotheringay drummer Gerry Conway performing "Let There Be Drums."